Come join us at Vanguard666, we are a friendly bunch of experienced individuals! If you're looking for an active, involved and a techy guild, look no further! - Level XII guild with max level Treasury (fame chests!) and max level Moxie. - A friendly group of highly experienced players from all around the world. 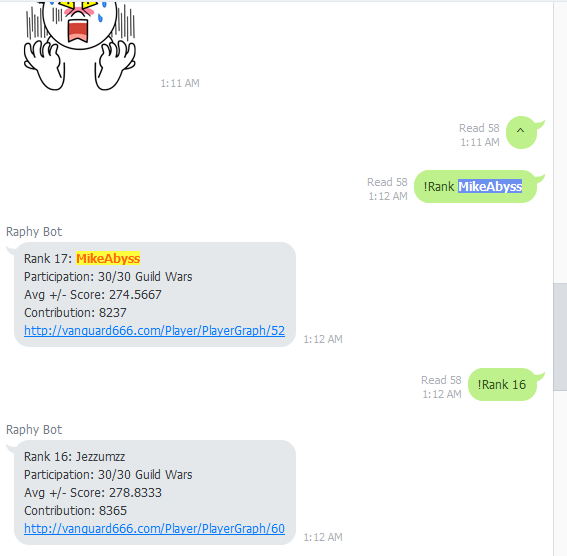 ~10% of the top 100 in LBF come from our little guild. - Torch Battle - Max rewards every event (960 shards now!). - Bosses - Boss 4 at 23:00 ST and Boss 5 at 23:07 ST.
- LI3/WG4 - If you are available at the same time daily we will arrange a permanent team. If not then we have an active chat dedicated to using excess LI3 cards. - HBD teams - You will never have trouble with a demon again. - Guild Wars - Jumping between the extremes, E.G (1st then 5th, 2nd then 4th etc) this a typical of top 50 guilds. We have an awesome website full of statistics! - Statistics on our competition, win rate etc. - Active players who love the game. - Line messenger. You don't have to contribute to chat, but we do need you to be able to see our announcements. - Guild Wars participation. We require 100% attendance with respectable scores for your might. We keep GW records and track averages, but the targets we set are very manageable. We are also understanding that real life conflicts sometimes but as long as you let us know in advance there won't be any issues. The above are the only solid requirements. Obviously, we'd love attendance in FF and Torch, but these are not deal breakers. Just participate and help out when you can. - Search for me1st in Line and message him (display name may be different). - If you have any questions feel free to comment below. We are currently looking to fill 2 spots! Bump, we currently have 3 spots open! Bump, we have three spots open! Bump, we have one spot open! Bump, come join! We still have a spot available! Bump, we have 2 spots opened!